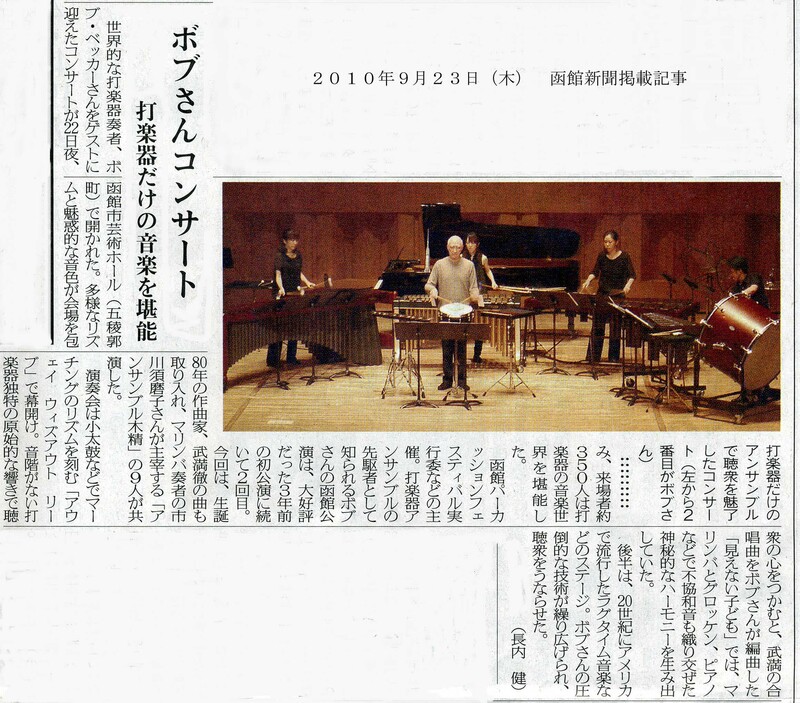 The world-renowned percussionist Bob Becker was featured as a guest artist in a concert presented by the Hakodate Percussion Festival on the evening of September 22 at the Hakodate Performing Arts Center. His performance enveloped the audience in an atmosphere of charming rhythms and attractive sounds. The audience of 350 enjoyed his skillful presentation. Becker performs with NEXUS, one of the world’s leading percussion ensembles. He last performed in Hakodate three years ago, and the success of that concert led to his being invited back again this time. This year is the 80th anniversary of the composer Toru Takemitsu’s birth, and Becker chose to play one of his pieces, Rain Tree. He performed with the local nine-member ensemble Kodama, directed by Sumako Ichikawa. The opening piece, Away without Leave, was performed on snare and military drums using marching rhythms. Unseen Child, scored for marimba, metalophones and cymbals, used unusual harmony and produced a feeling of mystery that touched the audience. Becker’s arrangement of Wings, Takemitsu’s song for mixed chorus, grasped the audience’s heart. The second half also featured ragtime music from early twentieth-century America. In this music, Becker’s overwhelming technique astonished the audience. 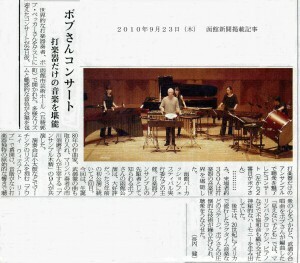 Photo caption: The concert was performed entirely on percussion instruments. Mr. Becker is second from the left. Can symphonic music become popular music?